PHUKET CITY: Crowds lined the streets in Samkong this morning for the Vegetarian Festival procession starting at Lim Hu Tai Su Shrine, which kicked off at the auspicious time of 7:19 am after two hours of religious ceremonies. 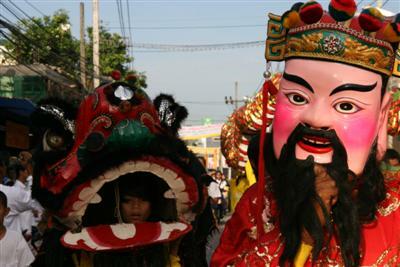 Visual highlights of the spectacle included dancing dragons and teams of men carrying ornate Chinese palanquins, with the deafening sounds of exploding firecrackers and banging drums throughout to keep evil spirits at bay. Scores of entranced devotees known as mah song (literally, “entranced horses”) were carefully looked after by their handlers as they endured the long walk barefoot through the city. Most were shaking, their eyes glazed over in a trance state allowing them to endure the pain of sharp objects thrust through their cheeks. Among the piercing objects observed this morning were swords, shovels, scepters and large metal hoops, to name just a few. This morning’s procession was the second of nine street processions to be held during the 10-day festival, which ends on the evening of October 8 with the lowering of the ko teng lantern poles and a farewell food offering to the Warrior Gods. A huge night of revelry at Saphan Hin usually follows the 10-day fast. For a complete list of activities, including procession routes and road closures, click here.